Click the state below to check the prices. 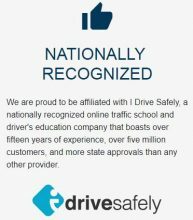 Does Your State Allow Defensive Driving Courses Online for Traffic Ticket Dismissal or Points Deducted from Your Drivers License Driving Record? For Insurance Discount? How about Senior Drivers Discount Course? If you have received a traffic ticket for a moving violation (speeding, running a red light, stop sign, etc. ), check with the court for which the ticket, summons, citation is written. Generally the court and appearance date will be written on the front of the ticket. You can usually search the internet for that court and get the information you need. City courts in most states will have a fee to be paid and approval to take the course if dismissal of the ticket is allow. Most states and court offer either deferred adjudication, diversion, or outright dismissal upon completion of the defensive driving course. Most all allow the online internet course, but a few still do not. The benefit in taking the low cost online defensive driving courses are that not only will you dismissed the ticket or get points deducted from your drivers license record, you can usually get an auto insurance discount as well! Many states and city or circuit courts offer an option to take defensive driving, known also as a driver improvement program and accident prevention course for dismissing a traffic ticket involving a moving violation. Speeding tickets are the most often common offenses which result in traffic fines or driving safety deferrals. A deferred adjudication or deferred judgement is a probation because a judge or court official authorizes the deferral of the fine. If a defendant remains on probation, usually 6 months to a year without getting a second charge, the case is dismissed. Many courts will ask the violator to take a defensive driving or driver improvement course in lieu of the fine and instead of a conviction record on the drivers license.